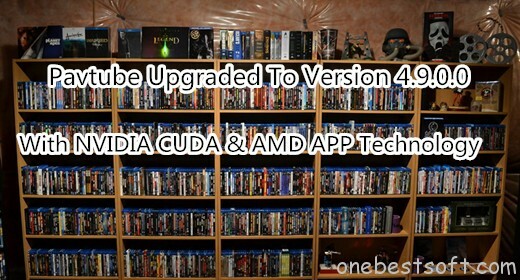 Pavtube BDMagic <review> is optimized by NVIDIA CUDA Technology. Now, it takes full advantage of the latest NVIDIA CUDA technology to largely accelerate conversion speed and output video quality. As a Top Blu-ray Ripper, it is able to convert all the newest 2D/3D Blu-ray/DVD discs to Any format much faster than ever before with 30x, which save the users much more time and energy. All off the Pavtube Windows Software are upgraded to support newest NVIDIA CUDA & AMD APP technology in video decoding to improve performance and ensure users much faster conversion speed than ever before when coping/ripping/converting DVD/Blu-ray, since more CPU resources are spared because of NVIDIA CUDA’s harnessing the power of GPU and AMD APP’s co-using of GPU and CPU. New version: v4.9.0.0 (12.20 2016 ). Support newest NVIDIA CUDA & AMD APP technology to accelerate video encoding by both H.264 and H.265/HEVC codec. Note: H.265 CUDA depends on whether your computer is geared up with H.265 encoding capable graphics card. Please refer to the document on official website of nvidia:https://developer.nvidia.com/nvidia-video-codec-sdk. Further added support for latest Blu-ray MKB v62, MKB61 and also other copy and region protection such as BD+, AACS, etc. Note: MKB62 is the new disc encryption used by many newly released Blu-ray disc. Wish to get full access to all your newly purchased movies to conveniently view them on your computer, media players, smartphones, tablets, game consoles, TVs, etc. Now, with Pavtube Windows Blu-ray Ripper software – Pavtube BDMagic can supported the new Blu-rays. Blu-ray with CUDA acceleration: how fast could it be? Ripping Functions: Convert BD and DVD discs to different formats, including movie folders, IFO/ ISO and HD/SD. Backup and Copy: The ‘Full Disk Copy’ bypass protections, enabling original quality and structure. Multimedia Devices: Provide coverage for a wide device’s range, including HDTV, iPod, iPhone, iPad, Apple TV, multimedia capable phones and regular players. Sync Technology: It comes with advanced synchronization routines to bring excellent quality. Subtitles and Audio Tracks: Enable to select subtitles and audio tracks for the destination. Preview and Snapshots: Users can capture snapshot’s series of the playing movie, saving them as image on hard-drive. Trim and Crop: The ‘Trim’ function allows to select movie’s scenes; the ‘Crop’ helps to cut off black edges or unwanted areas in the source. Profiles: Offer a huge list of conversion presets according to the output device, it helps novices to realize their jobs with professional quality. Output Settings: Adjust different parameters, for example, codec, aspect ratio, bit rate, sample rate, and audio channel. Watermarks: Support diverse watermark’s styles such as text, image, and clips, avoiding copyright issues. Note: Pavtube BDMagic is intended for personal use only, to protect own discs against loss. Simply click “File” > “Load from Disc” to load your Blu-ray and DVD movies. Then Choose“H.265 MP4 Video” in “Format” drop-down list. Now, move your cursor to “Tools” button on the top of the main interface to choose “Options”. 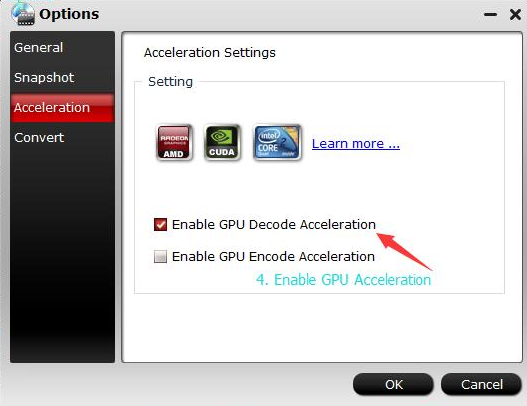 Then you can enable GPU acceleration.